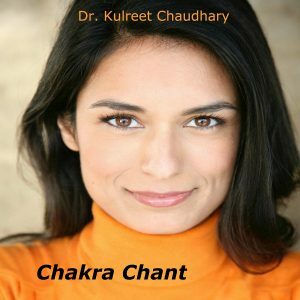 Chakra Mantra - Kulreet Chaudhary, M.D. Mantras are sacred sounds charged with power. The ultimate purpose of the use of mantras is to free the individual of all outer conditioning (familial, social, political, physical, mental etc.) so that you can come into contact with your true self. But the practical side-effect of the mastery of mantras is a vibrant mind and resilient body. Ancient Ayurvedic practitioners valued the role of mantras in reversing disease and restoring physical and mental balance. According to Ayurvedic philosophy, the human body is composed of five elements—space, air, fire, water, and earth. These five elements combine to form three fundamental physical-mental-emotional types, or doshas, that are present in everyone. Mantras have the capacity to change the mind and body through the alteration of the five elements through the chakra system. Connecting the five elements and the three doshas in the body is an energy system, called the chakras, that relays information to the different organs in the form of vibrational impulses. In the same way that humans have a physical body they also have an energy body composed of different vibrating frequencies. Chakras are energetic points of intersection that modify the five elements and directly allow mantras to impact physical, mental, and emotional states. This download (CD Baby or iTunes) is a recording of an ancient Sanskrit mantra used to balance the chakra system of the body and all of your internal organs. It has been recorded by myself, Dr. Kulreet Chaudhary, and my husband to be used as a very powerful meditation and should only be done as instructed. First begin with chanting the mantra out loud for only 5 minutes a day for three days. Then, increase it to 10 minutes per day for three days and then increase the duration again for a total of 15 minutes per day for three days. Finally, you can continue to chant the mantra for 20 minutes daily. Once you have the mantra memorized begin to chant it silently in your mind for 20 minutes a day and watch your health and mind effortlessly transform into a state of greater balance. Buy the Chakra Chant for a guided meditation: CD Baby or iTunes!